The spine text is the text that will be printed on the side of your dust-jacket, should you choose to buy one to wrap around the hardcover (this is selected when you place your order). It is not the text that appears on the Cover design itself, as you can add and edit that as you please. 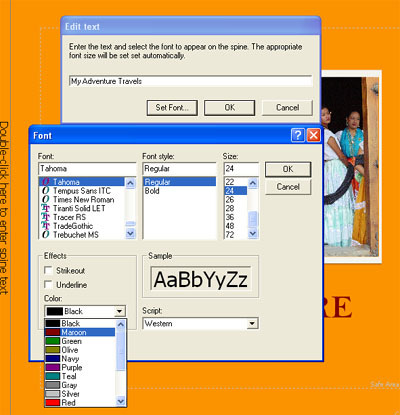 You can enter or edit the spine text in Cover View or Finish View. We suggest you choose a colour for your text that is in contrast to the background to make it easy to read when printed. If you can't see the spine text on your cover design check that the colour of your Cover text is not the same as the colour of the Background. By default the Momento software sets the font colour to black and the background colour to white. To set the background colour of your cover click the Background icon at the top right hand of the interface. The Cover Settings window will open presenting a range of colours for you to choose from. Select your preferred colour, click the OK button and you will return to Cover View. You may now need to change your font colour to make this stand out more. Note: At this stage the software only allows you to design the front cover and spine of the covers. When you have completed the layout for your cover design, you can return to Sort View, Layout View or Finish View to continue with the design or export for your photobook.